This is so funny. The look on the frog's face says it all! And, yes, I know "How dry I am" unfortunately. Happy birthday to your son. Hahaha this is AWESOME, Lynn! I love this card - this would be perfect for one of my brothers! Love the sentiment and the fun image! I'm sure your son loved this! This is wonderful Lynn, love the sentiment is gave me a little chuckle. Have a great weekend. TEE HEE!! Oh my gosh his card is a HOOT Lynn! I just love that sentiment and it looks to be the perfect card for your son too! Mine are not quite old enough for that part in their life...but will get there soon enough! :) Thanks for the Laugh out loud today friend! Have a great weekend! LOL!! OMGosh this is so cute and fun Lynn! I love that adorable frog having a cold one and what a fabulous sentiment! LOVE this card! You are just too funny Lynn. 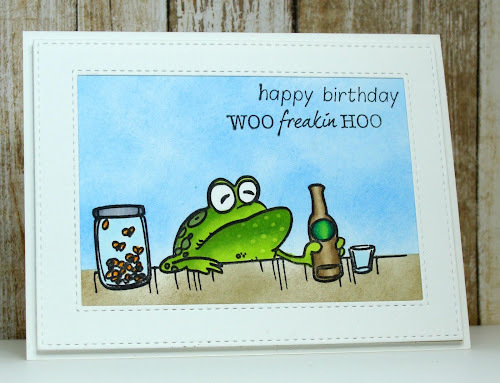 Great sentiment, background and adorable drinking frog. Absolutely hysterical, Lynn! I'm laughing myself silly. And I do know what "How dry I am..." means. Fabulously funny image and I love your coloring. That sentiment goes perfectly with the expression on that frog's face. It's like on Facebook...when they put a pic and say do you know what this is...Last week, it was wooden clothespins...an orange juicer...etc. I always know what they are...and YES, I usually still have what they are talking about...(Just used wood clothpins to hang up my wash yesterday. LOL! This frog is hilarious! What a fun birthday card for your son, Lynn! I have some sons-in-law that this would be perfect for! Oh,so funny Lynn..he is wonderful, fabulous colouring and love the flies in the jar..lol.. This is the first time I have laughed out loud today, Lynn!! Thanks for the fun!! That sentiment is to-die-for!!! So perfect with this frog at the bar!! OMGoodness, are you kidding me? What a great stamp and sentiment. Not sure which I like better. I must try and find both. This is look like one that should start... A frog walks up to a bar....Love, love, love. Yet another very fun card. How do dyou find these hilarious stamps? hahahahha... you do the best humour cards and I love them!